December provides an opportunity to rebound from a slow start and bolster NCAA Tournament resumes. The college basketball season is only three weeks young, but plenty of teams have already begun building strong resumes for the NCAA Tournament Selection Committee. Although there’s always chances for high-major teams to pick up quality wins in conference play, we’ve also seen the committee in years past put an emphasis on non-conference performance even for the big programs. December is a big month. It’s a chance for those who started slow to regain their feet before conference play. For those who fared better in November, it’s a chance to bolster their NCAA Tournament resume. Here’s a look at seven teams with the most to prove as we wrap up 2017. Arizona’s struggles have been well-documented. After climbing to No. 2 in the rankings, they Wildcats lost three straight and fell out of the Top 25 completely. We’ll learn a lot more about the Wildcats during a December that’s loaded with tough games. The Wildcats start off at UNLV, which boasts seven-foot NBA prospect Brandon McCoy, but the following two matchups are the biggest. They face Texas A&M — which has looked as good as anyone— on a neutral-site in Phoenix on Tuesday, and then Alabama on Dec. 9. Crimson Tide point guard Collin Sexton is averaging 24.7 points and 4.2 assists, and defending opposing guards has been a big point of concern for this team. We’ll find how if they learned anything from their struggles at the Battle 4 Atlantis. This should be Mick Cronin’s best team at Cincinnati, and the undefeated Bearcats could be national title contenders. But their toughest opponent so far has been Wyoming, a borderline top 100 team. Saturday begins a four-game stretch that features No. 21 Xavier, No. 6 Florida, Mississippi State and UCLA. Can Cincinnati win three out of four or even sweep? The Bearcats have a deep backcourt and a pair of terrific bigs in Gary Clark and Kyle Washington. They’re scoring more efficiently than previous Cronin teams, and they’re also playing at a much faster pace on offense, which is fun for us fans. It’ll be good for college basketball if the Bearcats are a legit top 10 team. Saturday’s Crosstown Classic with Xavier on FS1 is must-watch TV. The Zags have looked prettay, prettay good for a team that lost four of its top five players. Despite Mark Few’s track record, on paper this preseason, it looked like this could be his worst team in a while. But anyone who doubted Few (myself included) should feel silly. The Zags have already knocked off a much-improved Texas team, despite Josh Perkins nearly throwing the game away, and they also took Florida to double overtime two days prior. It’s pretty clear this team has Sweet 16 potential, but can they be a Final Four sleeper? Their weakest area so far has been defending the perimeter, allowing opponents to shoot 37.3 percent from deep. Florida, granted the Gators are among the nation’s best shooting teams, made 17 threes against Gonzaga last week. The Zags’ next two opponents — Creighton and Villanova — are not only high-quality opponents, but they’re very good outside shooting teams as well. We’ll see if Few has any defensive tweaks to slow them down on the perimeter. 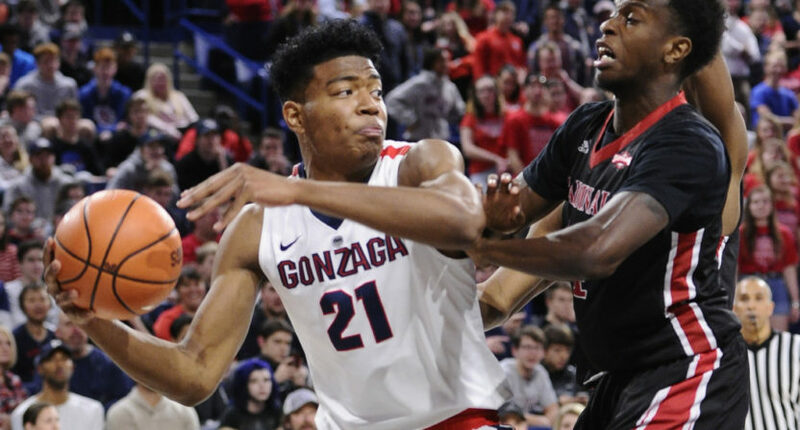 If Gonzaga can tighten up its perimeter D, it has the potential for a deep run. But allowing teams to shoot nearly a third of their shots from beyond the arc is asking for trouble, and potentially a first round upset, in March. After a down 2016-17, Oklahoma has a potential Top 25 this year led by freshman stud Trae Young, who’s averaging 28.2 points and 8.6 and doing it efficiently. The Sooners have played two games against potential NCAA Tournament teams — Arkansas and Oregon — and went 1-1. Young was awesome in both games and dropped 43 points in the win over Oregon, but he’ll face his tougher head-to-head challenges this month in USC’s Jordan McLaughlin and Wichita State’s Landry Shamet. Even Northwestern’s Bryant McIntosh and TCU’s Jaylen Fisher will present some new challenges for the freshman point guard. Plus, with the exception of Northwestern, these are legitimate top 30 opponents in games away from home. Oklahoma has some solid players around Young, but it’s pretty clear this team makes any big runs in the Big 12 or NCAA Tournament, he’ll be the one doing most of the damage. It’s time to see how he does against top competition. Can the Big 12 get eight (or even nine?!) teams to the NCAA Tournament? It’s going to come down to Kansas State and Oklahoma State. Kansas State doesn’t have much doing in December aside from games at Vanderbilt and Iowa State, but Oklahoma State has plenty going on. The Cowboys get a huge opportunity hosting Wichita State, which is still without star wing Markis McDuffie, on Dec. 9. Later in the month they’ll get two more KenPom top 40 opponents, facing Florida State and opening Big 12 play against West Virginia. In Oklahoma State’s only game against the KenPom top 150, it lost to Texas A&M. Not only are the Aggies one of the nation’s top teams, but Cowboys leading scorer Jeffrey Carroll made his season debut that night after a suspension and showed some rust with four points on 2-for-12 shooting. Granted he hasn’t faced a defense like that since, Carroll is averaging 19.7 points on 47.4 percent shooting. The Cowboys have an entertaining pair in Carroll and sophomore point guard Brandon Averette. By the end of the month we’ll have a better idea if that duo is good enough for the Big 12 to make NCAA Tournament history. It’s been 10 years since someone other than Wichita State has earned an at-large bid out of the Missouri Valley. Southern Illinois did it in 2007, and — although it’s still a long shot — Northern Iowa has a chance this year. But the Panthers will need an awesome December to pull this off. Nevada has looked really good during its 7-0 start. It’s risen to No. 41 in KenPom and holds a top 10 spot in RPI. Playing against a respectable schedule, the Wolf Pack has solid wins over Rhode Island, Davidson and Illinois State. But we haven’t seen Nevada play any really good competition away from home yet. That’ll change next week when they play at No. 22 Texas Tech and then meet No. 23 TCU on Dec. 9 at the Staples Center. If a mid-major makes the Final Four this year, Nevada is my pick. These two matchups will give us a better idea of how plausible that is.